The International Mechanical Code® (IMC®) establishes minimum requirements for plumbing systems using prescriptive and performance-related provisions. It is founded on broad-based principles that make possible the use of new materials and new plumbing designs. This 2018 edition is fully compatible with all of the International Codes® (I-Codes®) published by the International Code Council. The I-Codes, including this International Plumbing Code, are used in a variety of ways in both the public and private sectors. Most industry professionals are familiar with the I-Codes as the basis of laws and regulations in communities across the U.S. and in other countries. However, the impact of the codes extends well beyond the regulatory arena, as they are used in a variety of nonregulatory settings. Voluntary compliance programs such as those promoting sustainability, energy efficiency and disaster resistance. The insurance industry, to estimate and manage risk, and as a tool in underwriting and rate decisions. Certification and credentialing of individuals involved in the fields of building design, construction and safety. Certification of building and construction-related products. U.S. federal agencies, to guide construction in an array of government-owned properties. “Best practices” benchmarks for designers and builders, including those who are engaged in projects in jurisdictions that do not have a formal regulatory system or a governmental enforcement mechanism. College, university and professional school textbooks and curricula. Reference works related to building design and construction. In addition to the codes themselves, the code development process brings together building professionals on a regular basis. It provides an international forum for discussion and deliberation about building design, construction methods, safety, performance requirements, technological advances and innovative products. Purchase the newest edition of the code and references. This 2018 edition presents the code as originally issued, with changes reflected in the 2003 through 2015 editions and with further changes approved by the ICC Code Development Process through 2017. A new edition such as this is promulgated every 3 years. This code is founded on principles intended to establish provisions consistent with the scope of a plumbing code that adequately protects public health, safety and welfare; provisions that do not unnecessarily increase construction costs; provisions that do not restrict the use of new materials, products or methods of construction; and provisions that do not give preferential treatment to particular types or classes of materials, products or methods of construction. Get the 2021 code development schedule. Learn more about ICC's web-based code development process, cdpACCESS. 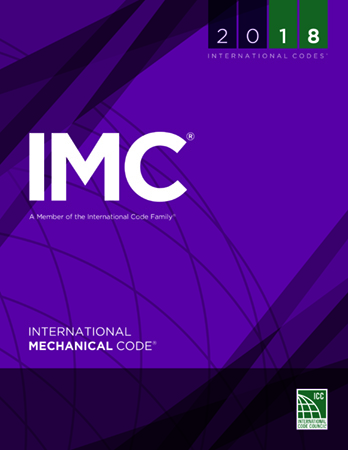 The International Mechanical Code (IMC) is in use or adopted in 46 states, the District of Columbia, Guam, Puerto Rico, and the U.S. Virgin Islands. As a model code, the IMC is intended to be adopted in accordance with the laws and procedures of a governmental jurisdiction. When adopting a model code like the IMC, some jurisdictions amend the code in the process to reflect local practices and laws. ICC publishes a wide range of support products and materials to help users and enforcers of the IMC to improve their knowledge and understanding of the code. Several key publications are provided below, or get the full list from the ICC Store. ICC offers certification programs for inspectors and examiners to the International Mechanical Code. ICC Evaluation Service (ICC-ES) is the United States' leader in evaluating building products for compliance with code. A nonprofit, public benefit corporation, ICC-ES does technical evaluations of building products, components, methods, and materials. Staff Code Opinions and Committee Interpretations are intended to provide technical support and clarification of code text for adopting jurisdictions, design professionals, and members of the construction industry. Technical Opinions on codes and standards are an exclusive benefit of ICC Membership. ICC provides a full suite of training courses geared specifically for the IMC. ICC instructors provide hands-on, practical problem-solving training and are available to teach on-site single or multiday courses. For more information, visit the ICC Learning Center. ICC operates a number of committees and councils related to the development and maintenance of codes and standards. There are several that relate specifically to the IMC.